We have collected 83, 27, 36 and 108 RNA-seq data for humans, pigs, rats, and mice in MTD. MTD version 1.0 is online now. A systematic transcriptome survey is essential for the characterization and comprehension of the molecular basis underlying phenotypic variations. Recently developed RNA-seq methodology has facilitated efficient data acquisition and information mining of transcriptomes in multiple tissues. Current mammalian transcriptomic databases are either tissue specific or species specific, and they lack in-depth comparative features across tissues and species. Here, we present a MTD that is focused on mammalian transcriptomes with a current version that contains data from humans, mice, rats and pigs. 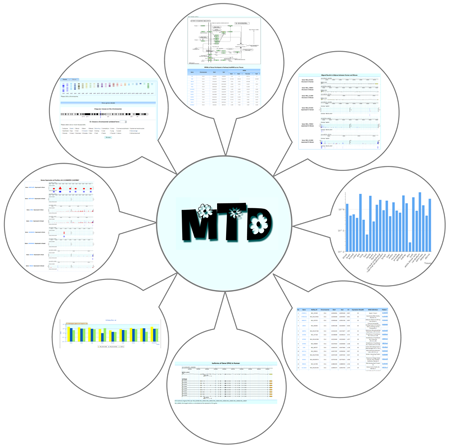 Regarding the core features, the MTD browses genes based on their neighboring genomic coordinates or joint KEGG pathway and provides expression information on exons, transcripts, and genes by integrating them into a genome browser. We developed a novel nomenclature for each transcript that considers its genomic position and transcriptional features. The MTD allows a flexible search of genes or isoforms with user-defined transcriptional characteristics and provides both table-based descriptions and associated visualizations. To elucidate the dynamics of gene expression regulation, the MTD also enables comparative transcriptomic analysis in both intraspecies and interspecies manner. The MTD thus constitutes a valuable resource for transcriptomic and evolutionary studies.